American adults are increasingly sharing a home with other adults with whom they are not romantically involved. This arrangement, known as “doubling up” or shared living, gained notice in the wake of the Great Recession, and nearly a decade later, the prevalence of shared living has continued to grow. While the rise in shared living during and immediately after the recession was attributed in large part to a growing number of Millennials moving back in with their parents, the longer-term increase has been partially driven by a different phenomenon: parents moving in with their adult children. In 2017, nearly 79 million adults (31.9% of the adult population) lived in a shared household – that is, a household with at least one “extra adult” who is not the household head, the spouse or unmarried partner of the head, or an 18- to 24-year-old student. In 1995, the earliest year with comparable data, 55 million adults (28.8%) lived in a shared household. In 2004, at the peak of homeownership and before the onset of the home foreclosure crisis, 27.4% of adults shared a household. A shared household is defined somewhat differently from a multigenerational household (although the two can overlap), as shared households can include unrelated adults and adult siblings. More adults live in shared households than multigenerational households: In 2014, 61 million Americans (including children) resided in multigenerational households. The nearly 79 million adults living in a shared household include about 25 million adults who own or rent the household. 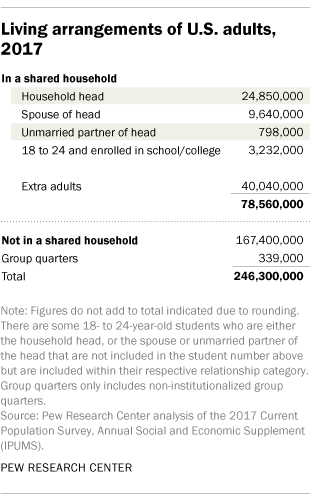 An additional 10 million adults are the spouse or unmarried partner of the head of the household. Another 40 million, or 16% of all adults, are the “extra adult” in the shared household. This share living in someone else’s household is up from 14% in 1995.